Top Rank executives and matchmakers have repeatedly stated that Terence Crawford has never turned down an opponent. Whether we’ll see him eventually make a title defense against Sergey Lipinets remains unclear, though. First, obviously, Crawford must defeat unbeaten Julius Indongo in their 140-pound title unification fight Saturday night in Lincoln, Nebraska. If Crawford (31-0, 22 KOs) leaves the ring at Pinnacle Bank Arena with his WBC and WBO 140-pound titles and Indongo’s IBF and WBA championships, a mandatory defense of the IBF title will be due against the hard-hitting Lipinets (12-0, 10 KOs). The IBF granted Indongo an exception, against Lipinets’ wishes, to challenge Crawford in a rare full championship unification fight (ESPN; 10 p.m. ET/7 p.m. PT). Crawford was noncommittal regarding facing Kazakhstan’s Lipinets during a recent reddit.com question-and-answer session with fans. Crawford would have to give up the IBF title if he doesn’t fight Lipinets next. The 29-year-old Crawford added, however, that he could continue to comfortably make the super lightweight limit of 140 pounds. The Omaha, Nebraska, native is widely viewed as one of the top five fighters, pound-for-pound, in boxing. If he decides to move up to the welterweight division, big challenges, literally and figuratively, would await him in the form of undefeated 147-pound champions Keith Thurman (28-0, 22 KOs, 1 NC) and Errol Spence Jr. (22-0, 19 KOs). 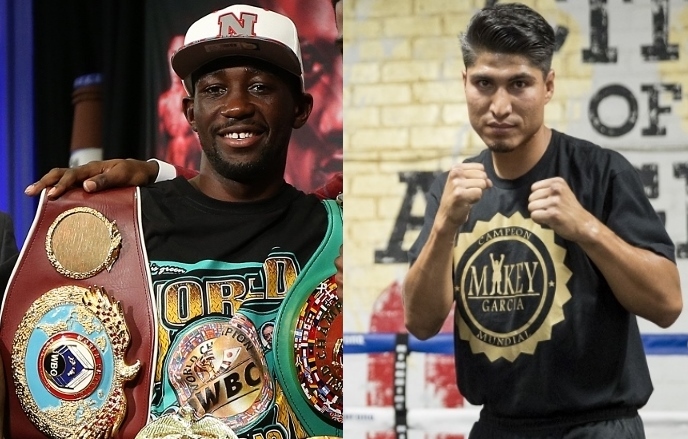 The biggest fight available for Crawford at 140 pounds probably is a showdown with unbeaten WBC lightweight champion Mikey Garcia (37-0, 30 KOs). Crawford admitted during the aforementioned reddit.com session that their fight could be difficult to make due to Garcia’s contentious relationship with Top Rank, Garcia’s former promoter. [QUOTE=Kigali;17952201]Stop all that moving up talk. He should stay and rule 140...[/QUOTE] Stay at 140 and fight who, after Indongo and no Mikey who else is there for him to fight at 140?